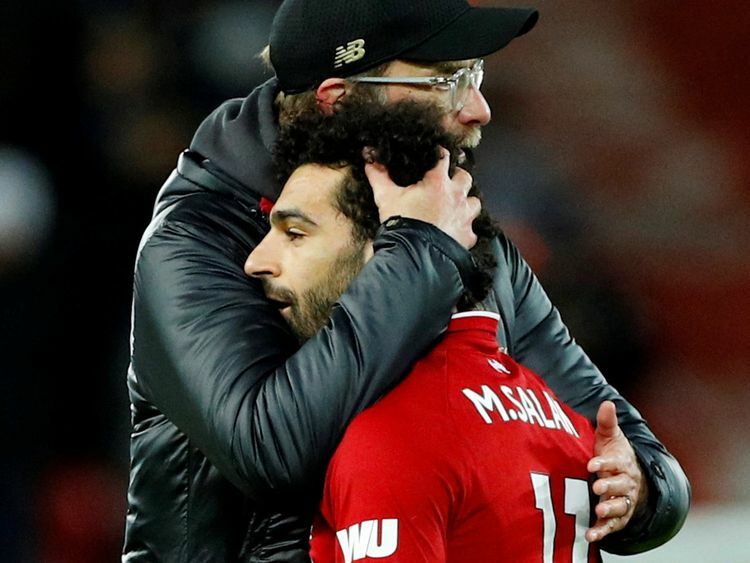 London: Liverpool wasted a chance to take complete control of the Premier League title race as Leicester earned a 1-1 draw against the leaders, while Chelsea’s bid for a top-four finish was rocked by a humiliating 4-0 thrashing at Bournemouth on Wednesday. After second-placed Manchester City lost at Newcastle on Tuesday, Jurgen Klopp’s side would have moved seven points clear at the top with a win over Leicester. But Liverpool, chasing a first English title since 1990, had to settle for a frustrating draw that left them five points ahead of champions City. “We put Leicester under pressure but we were unlucky with the goal in the last second before half-time. You have to take it how it is,” Klopp said. Following a warm-weather training break in Dubai, Liverpool were ahead in the third minute at snowy Anfield. Senegal winger Sadio Mane wriggled through the Leicester defence and slotted a clinical finish into the far corner for his 11th goal of the season. Liverpool’s quickest league goal since April 2016 had the Kop belting out songs of praise for their former manager Rafael Benitez, who masterminded Newcastle’s victory against City. But Liverpool quickly lost their rhythm and Leicester defender Harry Maguire punished sloppy marking from Virgil van Dijk to meet Ben Chilwell’s header with a close-range finish on the stroke of half-time. Liverpool appealed in vain for what looked a clear penalty when Naby Keita went down under a challenge from Ricardo Pereira. “It was probably the clearest penalty situation we have had. You will have to ask the ref why he didn’t give it,” Klopp fumed. It took a superb save from Alisson Becker to stop Roberto Firmino scoring an own goal as Liverpool were forced to settle for a point that gave City fresh hope. At Dean Court, Chelsea suffered a second successive defeat that left their bid to qualify for the Champions League under severe threat. The Blues, winners in just one of their last four league games, drop down to fifth place — below Arsenal on goals scored — with Manchester United only two points behind in sixth. Not for the first time this season, Maurizio Sarri’s team lacked a cutting edge, even with Gonzalo Higuain making his Premier League debut following the Argentine striker’s loan move from Juventus. Bournemouth made them pay in the 47th minute when Josh King converted a David Brooks pass. Brooks added to Sarri’s woes in the 63rd minute as the Bournemouth winger eased past the flat-footed David Luiz to lash in the second goal. Chelsea’s fans were furious, chanting “you don’t know what you’re doing” at Sarri when he substituted Higuain. But the misery wasn’t over for Chelsea, who conceded again in the 75th minute when King struck, before Charlie Daniels netted in stoppage-time to condemn the west Londoners to their heaviest league loss in over two decades. Tottenham staged a late fightback to close the gap on Manchester City to two points with a 2-1 win over Watford. After a miserable week that saw Tottenham knocked out of the FA and League Cups, Mauricio Pochettino’s third-placed side lifted the gloom at Wembley. Watford took the lead in the 38th minute after the latest mistake from error-prone keeper Hugo Lloris. Lloris completely missed his attempt to catch a corner and Watford defender Craig Cathcart headed into the empty net. But Son Heung-Min was back in the Tottenham side for the first time since January 13, having missed three games while on duty for South Korea at the Asia Cup. Son spared Tottenham further indignity as he pounced to drive in the 80th-minute equaliser. Fernando Llorente completed the turnaround when he headed the 87th-minute winner from a Danny Rose cross. Southampton rescued a crucial 1-1 draw against fellow strugglers Crystal Palace at St Mary’s. Wilfried Zaha marked his 150th Premier League appearance for Palace as the Ivory Coast forward fired home in the 41st minute. However, James Ward-Prowse levelled for Southampton in the 77th minute and Zaha was sent off in the closing moments after reacting angrily to his booking seconds earlier. Both Southampton and Palace are four points clear of the relegation zone.